My beautiful sister brought me this book back from San Francisco, and I am in love with it, an unashamed crush that makes me want to fly kites and sing enthusiastically and leave positive body image decals in fitting rooms. Yeah, it is that good! Have I ever steered you wrong, my dear friends? This is a collection of nine short stories, which I was already inclined to love, because I believe the short story is so often overlooked as a genre, and it is a great way to entice readers who are, perhaps, intimidated by a longer format, and disdainful of the shorter, though often more opaque, poem. Isn’t that sneaky? Besides, this collection is stellar. The stories all center around girls and young women, all told with a lush, almost magical, voice. La’s poet mother is dead, Tuck has two mothers, Winnie is in love with her boyfriend Cubby, who loves other men, and Pixie and Pony are the best friends to ever grace the pages of a book. These are their stories: full of sparkly hope, growth, and language that makes you think of paintings and constellations and water glinting off the ocean. You can finish the book in a few hours, but you will probably want to hold on to it for days. If you know a girl, or you are a girl, (I am pretty sure that is everyone. Just sayin’!) you should read this book. Here’s why: this collection is special because it returns the magic to femininity and celebrates that power inherent in young women, the strength that society so often likes to overlook . What I loved most was the contrast of the setting (often a gritty city landscape) and the tapestried beauty of the characters’ inner dialogues and relationships with others. The stories are straightforward in plot, and feel like little snapshots in a photo essay entitled “Being a Person”. Francesca Lia Block is the author of many amazing books, including Weetzie Bat and The Rose and the Beast. She won the Margaret Edwards lifetime achievement award, which is actually code for Super Amazing Goddess Writer Who Makes the World Better Just By Existing. Everything she has ever written is now on the top of my to-read list, and I am mailing this beautiful book to a friend who is going to love it, as long as she promises to mail it to someone else after she is finished. On a side note, do you remember when I reviewed The Particular Sadness of Lemon Cake by Aimee Bender, and someone described it as “magical realism”? I loved Bender’s style, and Francesca Lia Block gives me the same feeling. I think you will like it! On an even more unrelated side note, I got my student visa and am leaving for McGill in Montreal for library school this week! Oh sweet goodness, I am going to be a librarian! Happy Reading (and I love you)! Block, Francesca Lia. 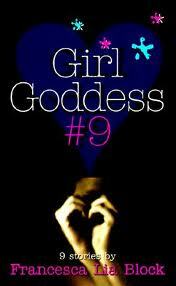 Girl Goddess #9. New York: HarperCollins, 1996. 181 pp. Ages 13 and up. Posted on August 22, 2011 August 22, 2011 by ShannaPosted in ALA Quick Picks for Reluctant Readers, Short Stories, YA LitTagged Aimee Bender, coming of age, feminism, Francesca Lia Block, girls, GLBT, HarperCollins, short story, Weetzie Bat. You are going to be an amazing librarian!